Meanwhile, State Department talks of “confidence building” and easing of sanctions. The White House envisions a "confidence-building" process with Iran that would involve Iran's revelation of the pace and scope of its nuclear program, Under Secretary of State for Political Affairs Wendy Sherman told the Senate Foreign Relations Committee at week's end. In return, she mentioned the possibility of easing some sanctions imposed on Iran for its refusal to comply with the United Nations' resolution demanding a shutdown of its uranium enrichment program. These sanctions target several sectors of Iran's economy, including its fuel exports. Meanwhile, however, several senators are preparing to propose a toughening of snactions against the Islamic Republic. According to Israel's Channel 2, Sen. Robert Menendez (D-NJ), who heads the Foreign Relations Committee, intends to submit these proposals this week, along with other senators. 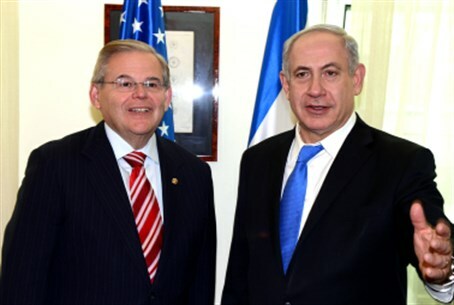 Menendez was among several U.S. senators and congressmen who met with Israeli Prime Minister Binyamin Netanyahu last week and told him that they support his call for harsher sanctions on Iran. Menendez told reporters after the meeting with Netanyahu, "Our determination to prevent Iran from obtaining nuclear weapons remains unchanged and we will not hesitate to sharpen the sanctions and use other options to protect U.S. interests and ensure regional security." In the Foreign Relations Committee session, Sen. Menendez said that “The new face of Iran looked and sounded very much like the old face, with a softer tone and a smoother edge," Even while the committee debated, he said, Iran's nuclear centrifuges were spinning. Sen. John McCain, R-Ariz., noted Iranian President Hassan Rouhani's record overseeing Iran's nuclear project before he became president. "Now, we're supposed to trust this guy? How much confidence do you have in this individual?" McCain asked. "I don't trust the people who sit across the table from me in these negotiations," Sherman replied. The exchange “quickly escalated,” reported USA Today, when McCain interrupted her repeatedly regarding a timeline for this "test" of Iran's intentions. "We enter this period with our eyes open," Sherman said. She emphasized that the United States would not put anything else on the negotiating table unless Iran "translated its words into transparent, meaningful and verifiable actions." Rouhani's sincerity and intentions should be clearer by mid-October when the United States, Great Britain, France, Germany, China and Russia sitting opposite Iran in Geneva, for full-scale negotiations about its nuclear program. Until then, she said, the pressure will be maintained. Israel – as well some Arab states, some European states, and key senators – oppose this gradual approach, demanding instead that an “all or nothing” approach be adopted. Easing sanctions in exchange for unimportant Iranian concessions would only allow Iran to continue developing its nuclear weapons, they claim.